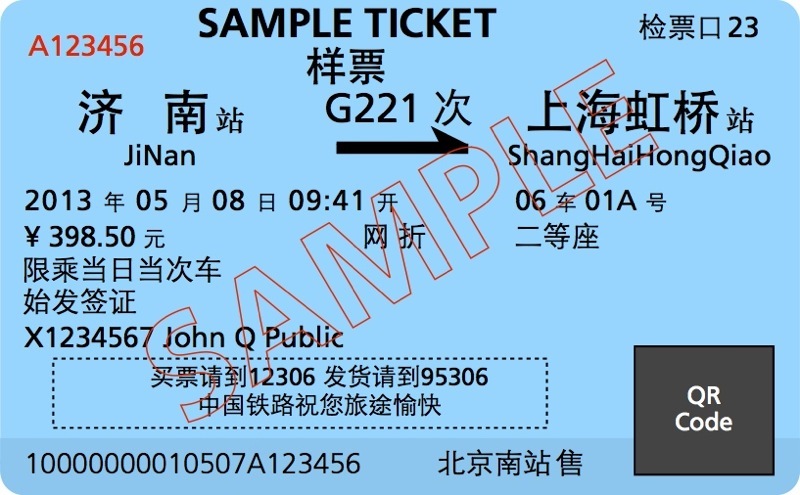 Chinese railway tickets are generally issued in Chinese only. This makes sense, however, since locals account for the vast majority of passengers. Fortunately, help is at hand here for those of us with language difficulties. This sample ticket used is in blue, but pink tickets will have the same layout. Remember to only insert blue ticket into automated ticket gates, as pink tickets will have to be validated by hand. ▶ Desktop and laptop users: Hover over the “i” (info) icon. ▶ Mobile and tablet users: Tap on the “i” (info) icon. ▶ To make a tooltip go away in full, click or tap on a part of the blue ticket that does not have an “i” icon. This is your abbreviated ticket number. You will board your train from this gate. This will be shown in simplified Chinese characters and Hanyu Pinyin. Please note: This may or may not be the exact same as the English name of the station. This is your train number, or train code. The date is always written as Year-Month-Date. Times are all in the standard 24-hour format. You will be seated in this carriage (车) and at this seat (号). Tip: It is probably best to board from this carriage, as some trains might be coupled. If you wish to change seating, the other passenger(s) must agree. This is how much you paid for this ticket, in Chinese Yuan Renminbi. These include if this was a ticket picked up from an order made on the Web, or if this is a concessionary ticket, amongst other remarks. This is your class of travel. This will show you for how long your ticket is valid, what route to use (if any), and if this was rebooked. Your name and ID document number will be printed here. ▶ Learn more about Personal Ticketing and the ID requirement. This is reserved for ads and other special messages, generally from the railways. This area should bear a QR code. Note: Scanning this on any reader other than that used by the official railways system is likely to result in gibberish being displayed. This is the full, 21-digit ticket number. This is where you got the ticket, either at the counter, or by picking up a pre-ordered ticket. This is in simplified Chinese characters only. The above image is interactive. Characters ending with 验证: Designated Ticket & ID Validation at Stated Station Only. These are very rare, but in the event you get one of these, you must travel to the designated station to complete Ticket & ID Check procedures. 候车地点: Wait For Train Here. This will also show your specific location in Chinese.